Dell announced today two new additions to their blade server family – the PowerEdge 11G M710HD and the M610x. The two new servers are just a part of Dell’s “Blade 3.0 Launch” – a campaign highlighting Dell’s ongoing effort to become the leader in blade server technology. 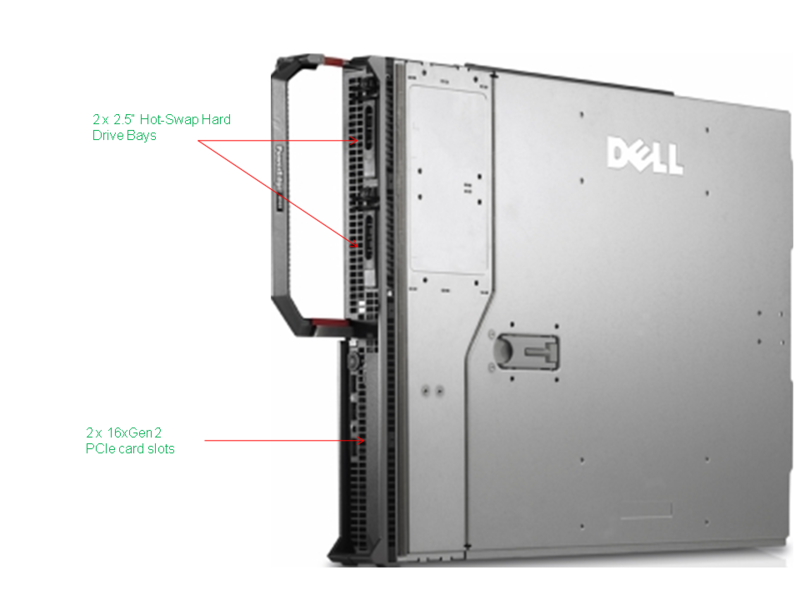 Over the next several months, Dell will be making changes in their chassis infrastructure introducing more efficient power supplies and fans that will require up to 10% less power over existing chassis. Don’t worry though, there will not be a new chassis. They’ll simply be upgrading the fans and power supplies that ship standard at no charge to the customer. Dell also has announced a significant upgrade to their Chassis Management Controller Software (CMC). This is great news, as Dell’s chassis management software interface had not had an update since the early part of the decade. The CMC 3.0 release offers a better user interface and ease of use. One of the key features that CMC 3.0 will offer is the ability to upgrade the iDRAC, BIOS, RAID, NIC and Diagnostic firmware to all the blades at one time offering huge time savings. Expect the CMC 3.0 software to be available in early July 2010. For demo’s of the new interface, jump over to Dell TechCenter. On paper – the Dell M710HD looks like a direct competitor to the HP Proliant BL490 G6, and it is, however Dell has added something that could change the blade server market – a flexible embedded network controller. 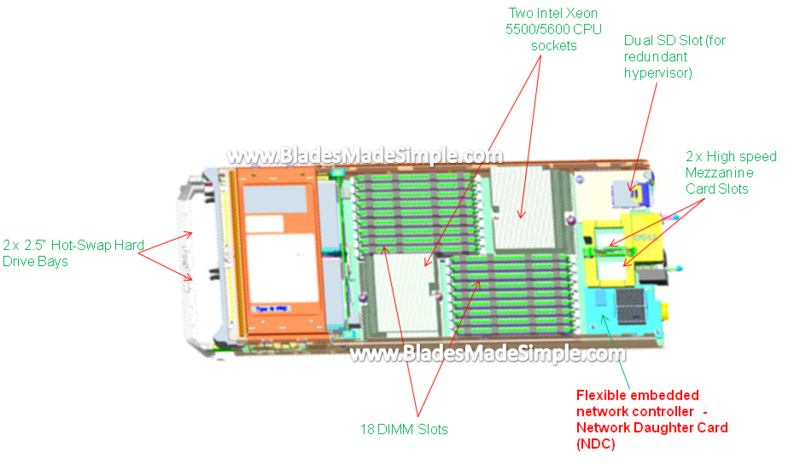 The “Network Daughter Card” or NDC is the blade servers LAN on Motherboard (LOM) but on a removeable daughter card, very similar to the mezzanine cards. This is really cool stuff because this design allows for a user to change their blade server’s on-board I/O as their network grows. For example, today many IT environments are standardized on 1Gb networks for server connectivity, however 10Gb connectivity is becoming more and more prevalent. When users move from 1Gb to 10Gb in their blade environments, with the NDC design, they will have the ability to upgrade the onboard network controller from 1Gb to 10Gb therefore protecting their investment. Any time a manufacturer offers investment protection I get excited. An important note – the M710HD will come with a NDC that will provide up to 4 x 1Gb NICs when the Dell PowerConnect M6348 Ethernet Switch is used. 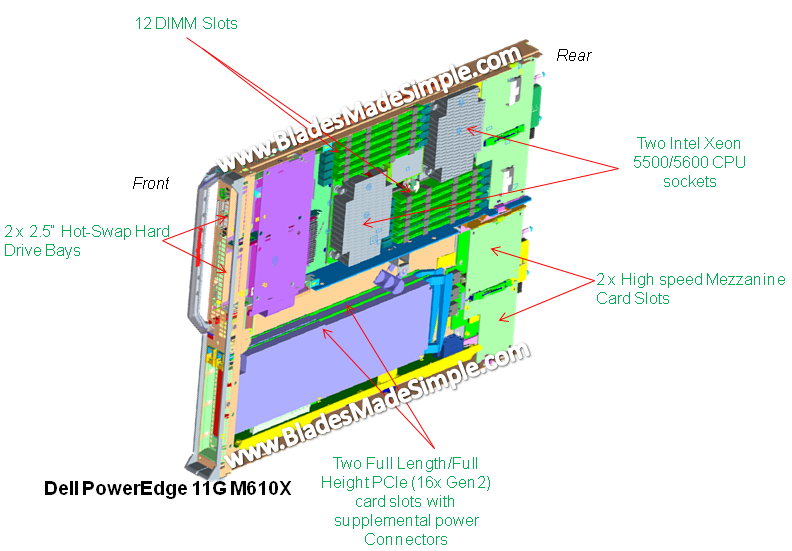 I know the skeptical reader will think, “so what – HP and IBM have PCIe expansion blades,” which is true – however the M610x blade server differenciates itself by offering 2 x PCIe 16x Generation 2 slots that can hold up to 250w cards, allowing this blade server to handle many of the graphics cards designed for GPGPU or even the latest I/O Adapters from Fusion I/O. Although this blade server can handle these niche PCIe cards, don’t overlook the opportunity to take advantage of the PCIe slots for situations like fax modems, dedicated SCSI controller needs, or even dedicated USB requirements. I’m curious to know what your thoughts are about these new servers. Leave me a comment and let me know. For your viewing pleasure, here’s some more views of the M610x.